Summer feels long since past with the weather we have had lately but it was really not that long ago. Fall began a little more than a month ago so I decided to take a look at the Blackhawk Country Club real estate market this summer versus last. Interestingly, home sales were down over 2011 which really does not jive with the rest of the market. While inventory of homes for sale remains a problem in the area I am not going to worry too much since this is just a four month snapshot. The jump in the median home price was welcome news though while marketing time for single family homes remained steady. Sales of townhomes were steady and the time it took to get them into escrow dropped dramatically while the median price jumped nicely as well. 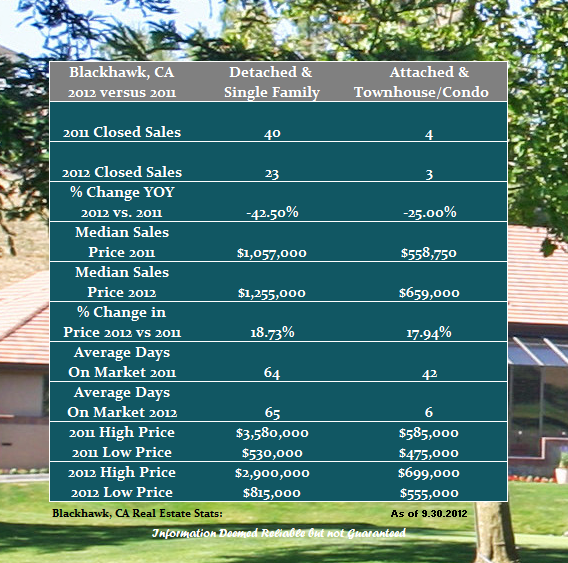 Share the post "Blackhawk Country Club Summer 2012 Real Estate Report"